If we are peaceful. If we are happy. Anhui Province is located of the central region of eastern China spreading across the basins of the Yangtze River and the Huai River. It is bordered by other tea producing regions: Shandong to the north, Jiangsu to the east, Henan to the northwest, Zhejiang to the southeast, Hubei to the southwest and Jiangxi directly to the south. The capital of the province is Hefei. 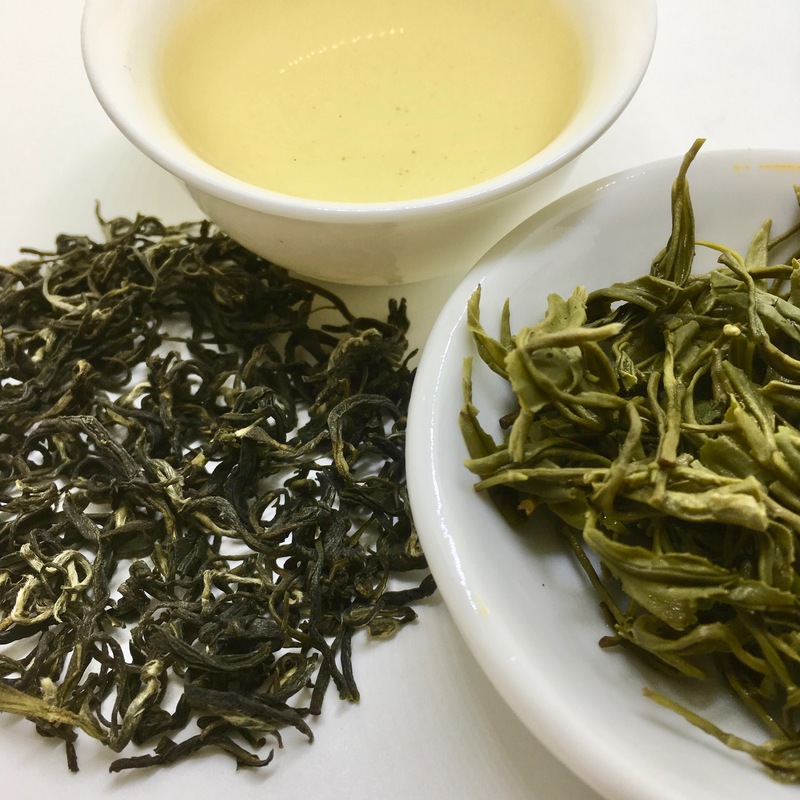 Anhui is probably more famous for the very popular Keemun black teas but also for several legendary green teas including a uniquely large and hand-flatted leaf style Taiping Hou Kui (Monkey King). “Nine Glorious Mountains,” from China’s An Hui province, specifically Jiu Hua mountain, one of the four sacred mountains of Chinese Buddhism. During the great dynasties of China, this mountain was home to over 300 temples. It’s also a beautiful landscape rich in pine forests, waterfalls, streams and interesting rock formations. Sounds like a wonderful place for tea to grow and thrive. Anhui province in eastern central China is distinguished by varied richness, spanning geographies which include broad plains in the north, major rivers and watersheds, and as one moves south, a topography that becomes more mountainous and less populated. Anhui is also the birthplace of half of the teas in the traditional listing of the “Top Ten Famous Teas of China”, including the sweetly delicate Huangshan Mao Feng, Liu’an Gua Pian ‘Melon Seed’, Longjing projenitor Ding Gu Da Fang, startlingly long-leafed Taiping Houkui, and the richly brisk Keemun black tea. Anhui represents a transition zone between subtropics zone and warm temperate zone. It has temperate climate, abundant rainfall and distinct four seasons. The temperature for a year is about 15° C (59° F). Anhui is one of China’s many multi-faceted treasures; geographically isolated enough to maintain it’s own character, yet Anhui became an historically important and influential source of wheat from the North, rice and tea from the South, minerals from the Mountains, paper and ink stones, calligraphy, philosophy, opera, medical advancements, and printing technology from across the province. While somewhat protected geographic barriers such as major rivers and mountains, Anhui became something of a ‘melting pot’ of the cultures from the surrounding regions, reflecting important agricultural, political and cultural connections that stretch back thousands of years. Even the name ‘Anhui’ is a contraction of two of it’s historic prefectures: Anqing and Huizhou. Some of the more mountainous regions of southeastern Anhui are enclaves for their own unique cultures. • Bi Sheng (ca. 990-1051 AD), a commoner who, hundreds of years before Germany’s Gutenberg, developed ‘moveable type’ and a process of printing characters with re-usable carved and fired clay discs. These could be created and combined to form a printing plate with words and blocks of text, inked and pressed with paper, then taken apart and put into an organized type case for later re-use on other printing projects. More Videos about Anhui Province and the making of their unique teas.